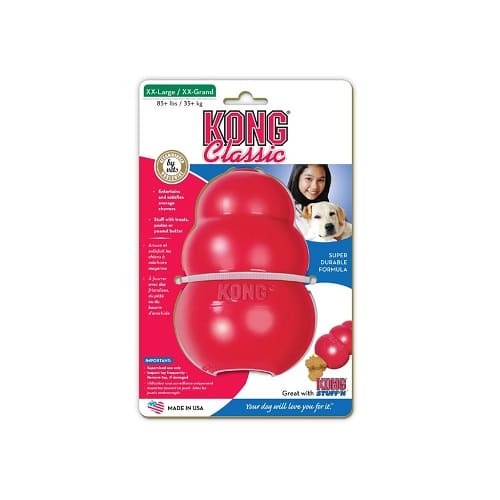 KONG dog toys Classic range are popular bouncy toys and irresistible treat dispensers. They are made from a red thick and natural rubber compound. The Classic Kong dog toy is the perfect toy to buy for dogs that love to chew. 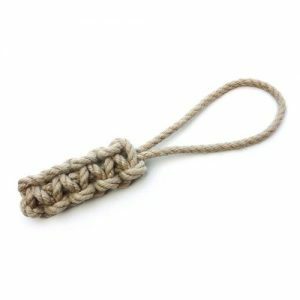 This boredom buster provides long periods of entertainment and mental stimulation for your dog or puppy . The strong rubber formula provides long lasting fun. Your pet will spend hours of fun trying to get treats out of the hollow middle of this toy, providing a controlled way of giving them food. 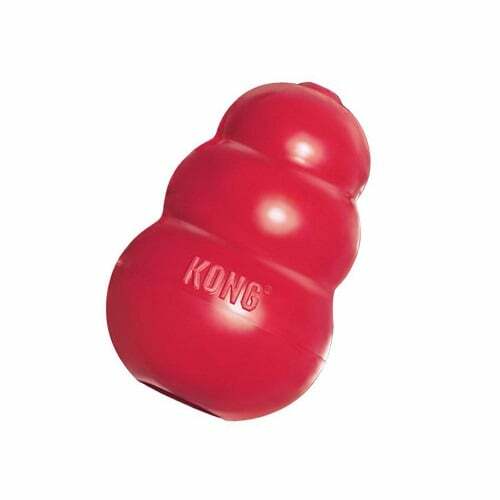 Wet and dry treats can be put inside this Classic Kong original dog toy. This fun and interactive toy has been keeping dogs amused and entertained for many years. A wide variety of KONG Stuff’N treats are available. Its distinctive design provides an unpredictable bounce in different directions for lots of fun games of chase and fetch. Healthy play reduces boredom in dogs and puppies furthermore it can also reduce separation anxiety. 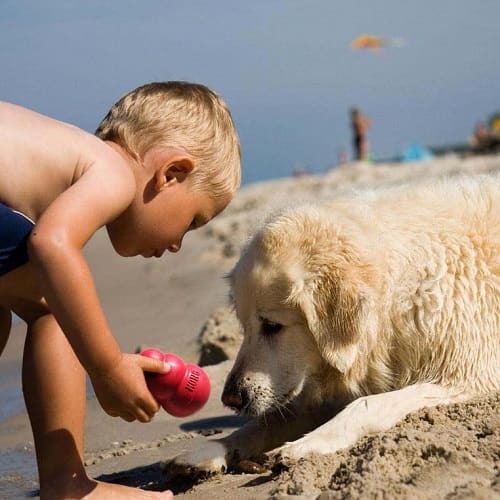 Encouraging dogs to play also helps expend excess energy and this can improve behaviour. Classic Kong dog toys provides exercise and improves jaw strength. Strengthen the bond between you and your pet with interactive play that a Kong provides. Vets and Dog Trainers recommend this. Puncture resistant, non abrasive and doesn’t splinter. Customers can choose from a variety of sizes, whichever is appropriate for your breed of dog. We know that’s it’s difficult choosing the right size Classic Kong for your dog, so we’ve put together a list of suggested breeds for the different sizes as a rough guide. Small – Chihuahua, Bichon Frise, Pug, Maltese, Pekingese, Shih Tzu. Small or Medium – Minature Schnauzer, Minature Poodle, Yorkshire Terror. Medium – Cavalier Spaniel, King Charles Spaniel, Corgi, West Highland Terrier, Welsh Terrier, Whippet. Medium or Large – Beagle, Cocker Spaniel, Pug. Large – Border Collie, Dachshund, Springer Spaniel, Airedale, English Setter, Afghan Hound, Bull Dog, Borzoi, Bearded Collie, Pointers. Extra Large or Large – Basset Hound, Boxer, Bull Terrier, Collie, Standard Poodle, Newfoundland. Large, Extra Large or Extra Extra Large – Doberman Pinscher, German Shepard, Golden Retriever, Labrador Retriever. To prevent treats falling out of classic Kong dog toys choose larger treats than the hole size and cut them down length wise to fit the size of the hole. The ability to freeze the rubber Kong chew is especially useful because it allows the food inside to last longer. 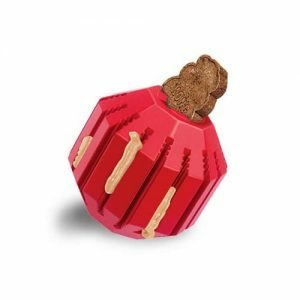 Your pet will love the Kong Classic dog toy even more if you put some peanut butter inside (Please ensure the peanut butter does not contain Xylitol). Dogs get bored quickly with a toy. What’s good about Classic Kong dog toys is that you can vary what is stuffed inside and maintain the animals interest for longer. Be aware that there are a lot of calories in some treats so reduce your dogs normal food to compensate. Pet owners of dogs that destroy the Classic Kong dog toy quickly should try a larger size or even consider the Kong Extreme range of dog chews. Find out how this reliable and renowned Kong brand, which is often produce some of the best dog toys around, came to exist. This video tells the story of how such an iconic toy came to be produced. Also watch the Kong classic in action. Not used Classic Kong dog toys before! then don’t worry, your dog will soon pick it up. Start out with something easy. Put a few small dog treats inside that will easily come out and seal the hole with peanut butter or cream cheese. Your pet will instinctively start chewing and pushing the Kong around to get at the treats. Most dogs will start to become experts at getting the treats out so you can start to increase the difficulty. Then put food in that will only just come out, seal the hole and freeze for a while. A dog will spend hours trying to get food out of the Kong dog toy and usually be tired at the end. Adjust the fillings to keep them interested. If needed, adjust your pets food intake to allow for the extra calories they get from treats. This video provides a demonstration of how to fill Kong dog toys. It also provides a useful advice on how to clean your kong toy. It’s important that dogs can get the treats out, so start out by making it easy for them. For more experienced dogs, make it a bit harder by packing the food in tighter or stuff biscuits just inside the opening hole. Where can I buy Kong Dog Toys at great prices? Well look no further, we have a specially chosen range of Kong dog toys, some are listed below. Which Classic shaped Kong dog toy is right for my dog? Did you know that as your dog ages their teeth will change in number, size and strength? Due to this, Kong dog toys come in a variety of rubber formulas. 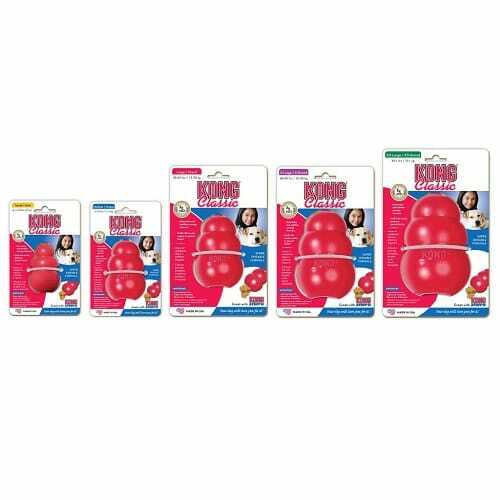 At about nine months dogs teeth are fully set and should then move onto Kong Classic (red colour) or the Extreme Kong (black colour) depending how powerful their chewing is. As your canine friend gets older their biting strength becomes weaker. The Kong senior is made of softer rubber is gentler on ageing teeth. The colour of these is usually purple. Are you wondering, what recipes and treats to put inside a Kong? Well you’re in the right place. We’ve put together some great recipe ideas for you to try. Warning please ensure that if you use peanut butter in any of the following recipes that it does not contain Xylitol (Xylitol can be harmful to dogs). First fill the Kong a third full of dog food. Then pour in warm melted peanut butter (make sure it’s not too hot!). Then add another layer of dog food, follow this with more melted peanut butter. When the Kong toy is full, freeze until solid, serve and watch the fun begin. This layering technique encourages your dog to explore what’s further inside. Mix together some cheese spread (or small pieces of cheeses) with some dry dog food. Place in the microwave until the cheese melts. Allow to stand until completely cool but still runny and then pour into the Kong toy. Then freeze thoroughly. Crunch up into small bite-sized pieces two or three doggy biscuits. Mix in a couple of spoonfuls of peanut butter and plain yogurt. Mix everything together in a bowl until soft, but do not allow to get runny and start stuffing the Kong. Mix up in a bowl a small amount of banana and add a little unsweetened applesauce. Then combine small amount of plain yogurt. Next add oatmeal, until a thick consistency is achieved, then stuff into the Kong dog toy. Then freeze and serve. Add any small chopped up vegetables to the scrambled egg mix. Pour into the Kong and fill hole with some cheese. Place in microwave for about 20 seconds (vary according to size of toy). Allow to thoroughly cool and feed to your pet. This is a great way use up left over vegetables. Mash together some freshly boiled rice, cooked sweet potato and a small amount of peanut butter. Pour into the dog toy, allow to cool and it’s ready to serve. Alternatively freeze and use later. Seal the small end of the Kong with a lump of peanut butter, cheese or other sticky food. Then, place the Kong, into a mug, small end down. Fill the up-turned Kong with mixture or liquid. Put the mug into the microwave or freezer. When ready serve. Stuffed Kong’s that have a frozen filling will provide a longer-lasting treat. This toy often features in the best dog toys top 10 lists This video shows the large range of sizes available for this favourite doggy toy. From small to large there is a perfect size kong for your pet. It also gives a simple guide to some of the features of this toy chew. Chewing is a natural behaviour for dogs and provides physical and mental health benefits. When your dog chews a Kong dog toy it will release calming hormones that will make your dog feel good. So as well as keeping them busy and providing quite time it also enables them to reduce stress. As well as being natural chewers they are also very good scavengers and love hunting for food. Classic Kong toys allow them to satisfy both of these instincts. 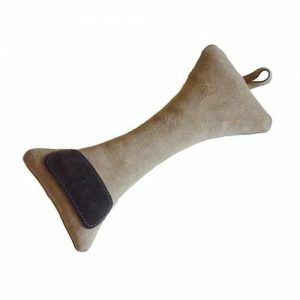 As food can be put inside the dog toy, they can have fun and games trying to retrieve the food as well as stopping to have a relaxing chew. 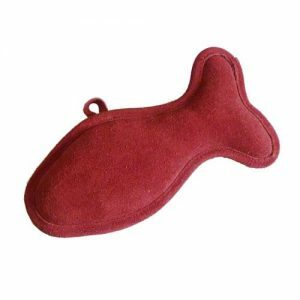 The relaxing and de-stressing benefits provided by Kong dog toys can be used in a number of ways. For example if you have a nervous dog this can help give them confidence. 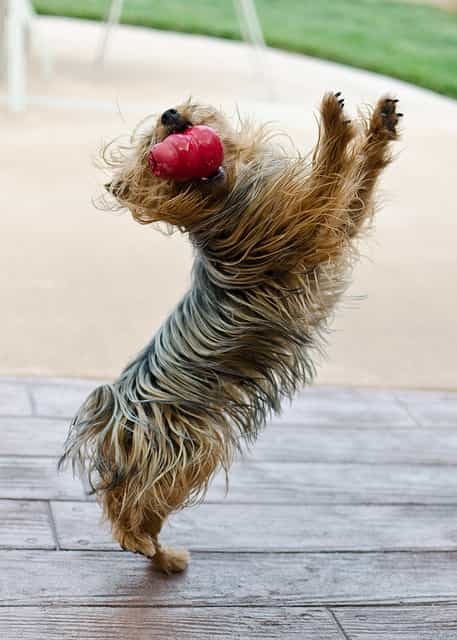 The familiarity of the Kong helps in stressful situations such as new environments, trips to the vet, when they stay in kennels or with friends. Dogs can play with Kong toys for some considerable amount of time, especially if combined with periods of play and games. As a result dogs will burn off a lot of energy and calories. So Kong dog toys help to keep your dog active and physically healthier. Common behaviour problems, such as barking, digging and chewing, can always be traced back to a dogs natural instincts. They will become frustrated if these natural instincts are suppressed. Instead of trying to stop these behaviours satisfy them in more acceptable ways. Games like fetch, chase, tug and retrieving treats using a Kong toy are great ways of doing this. There are other ways to use Kong dog toys to improve behaviour. If your dog chews on things it shouldn’t, instead of punishing them, encourage them to drop what they have and offer them a Kong toy with treats inside. You are offering a better treat so they are less likely to run away or hide. The aim is to encourage your dog to swap what he has for a higher reward. By repeating this process your dog will learn to chew on the toy rather than objects you don’t want chewing. Use this technique to change other aspects of a dogs behaviour. Also use this training technique to teach them new tricks. A Classic Kong dog toy must be replaced if damaged, contrary to popular belief, Kong dog toys are not indestructible. Supervise the toy at all times. Be careful that items you put inside won’t stain the carpet of flooring. Please ensure that any peanut butter you use does not contain Xylitol, as it can be harmful to some dogs. To find out more about the Kong toys range, then we recommend the Kong UK – Rubber dog toys website. My dog Rosie, a poodle, loves the Classic Kong toy. She plays with it regularly every day. Would definitely recommend. What a great product! My two springer spaniels have loads of energy and their Kong toys will always keep them occupied for quite a while. Toys rarely last long in our house but I find these dog toys to be durable and hard wearing, over a year later and it’s still in good condition! They are fairly easy to wash, and we have filled them with all sorts of biscuits, peanut butter, vegetables and dog food! Can be frozen too! Excellent product would highly recommend. Happy dogs and owners! My cocker spaniel loves the kong dog toys range, particularly the classic range. The guide to the best size kong for a type of breed is very useful. They delivered quickly without any problems.